This bathroom decorating style with its attention to detail and variety of colors and shapes, creates a striking effect in a master bathroom. Inspired by the vibrant mosaics of Antoni Gaudi in the Park Guell in Barcelona, the bathroom tiles are the main decorating element in a bathroom that is daring, full of surprises and totally unique. With such a riot of colors used in the tiles, you can easily pick out a few colors to use in larger areas: Royal Blue for the claw foot tub, sea green and burnt orange for the walls - and towel sets in whichever color suits your mood. 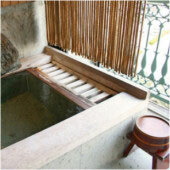 Although there are many handcrafted and unique elements in use in this bathroom, this style of bathroom decoration is not an example of an Arts and Crafts bathroom. In that style, there are recognized motifs which were typical from that era - i.e. the late 19th and early 20th century - as well as materials and furniture which should be replicated if you are striving to create an Arts and Crafts bathroom. Bathroom decor should not be restricted to purely functional elements. The Objets d'art on display reflect the homeowners' deep love for African art with it's expressive forms and symbolism. 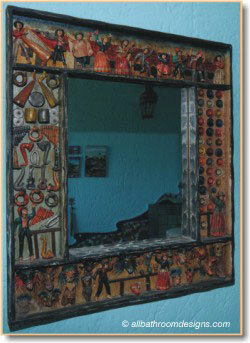 The bathroom mirror, transported with much ado from Peru, fits in beautifully with its vibrant colors and detail. 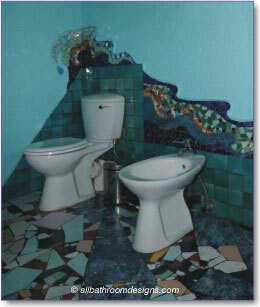 The architecture of this house echoes the zany bathroom decorations. The shower enclosure extends vertically above the roofline into a stone turret, with windows at the apex that lets in natural light. The mosaics cladding the shower interior is darker in tone at the bottom with lighter, earthier tones as it extends upwards. Although the execution of this type of bathroom decorating may seem random, it is not the case! It is vital to do your drawings beforehand and to work to a plan. 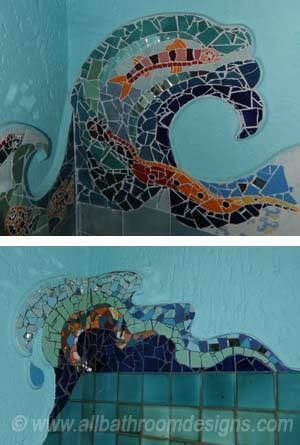 Note how a geometric area in turquoise whole tiles is offset with the free-flowing forms in multicolored mosaic tiles. The design for this area of the bathroom behind the toilet and bidet, was specifically planned in this way. If you are planning to breathe new life into an existing bathroom, you can print photographs of the various floor, wall or fixture areas that you want to transform. Make the prints as large as possible. Then place transparent paper over the photographs and start playing around with shapes and color. Alternatively, you can draw directly onto your walls and/or floor with chalk, if you prefer a "direct" approach. Once you've done your bathroom decorating layouts and planned your colors, the fun starts! 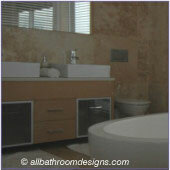 For those areas where you'll be using whole tiles, you should buy good quality bathroom tiles. For the mosaic areas, you can use "rejects" or c-grade tiles, since you'll be smashing them to pieces anyway. Important Note: Use safety goggles and protective clothing when breaking up tiles. 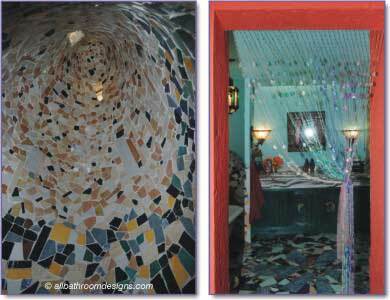 The homeowner of this bathroom had no training in making mosaics prior to doing this project. She used standard tile cement to embed the mosaics and worked in sections. It is important to get the tiles level though. Standard grout for walls or floors was used after setting the tiles, and here too it is important to ensure that there are no sharp edges or corners protruding that may cause injury. If you prefer a more restricted color palette, visit our Bathroom Decoration page for a different - yet equally beautiful - execution of this bathroom idea. 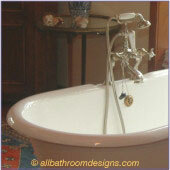 And if you love the vibrancy of the colors and shapes, you may also enjoy African Designs in your bathroom.